Orchids are amazingly beautiful plants, seemingly exotic and often surrounded by an air of mystery. They've taken on a bad reputation of being difficult to grow, requiring a lot of work and maintenance, but the reality is they are actually hardy plants that aren't any more challenging to care for than other flowering ornamentals. Their care is just different. There are many varieties of orchids available and yes, some are fussy, but many are extremely adaptable to the light and temperature conditions found on the windowsills of homes and apartments. One of most important aspects of caring for orchids is to replant/repot them frequently. Using thes following tips, you'll be rewarded with healthy, beautiful plants that can be coaxed to bloom repeatedly. Unlike many of the other flowering ornamental plants, orchids do not grow in potting soil. They are grown in loose, chunky, potting substrates such as bark, charcoal or moss; they only need the growing media to anchor themselves to. This means plants need to be repotted when their growing media begins to break down or the roots start coming out of the top of the pot. According to the American Orchid Society, repotting is done with the root system in mind, not the foliage. There isn't a specific time of year, or season, that is best for replanting or repotting an orchid. Instead, it's best to time this transition to a larger container just after the plant has finished flowering and new growth is beginning to emerge. Look for a new container that is only slightly larger in size. Choose a pot that is orchid specific – perforated for air movement – or opt for terra cotta or plastic that has plenty of drainage. Increase container size by one to two inches in diameter at most. 4. Do not use potting "soil"
In their native habitat, orchids attach themselves to other plants instead of growing in the ground. To give them a similar environment for growing, use a potting/growing media recommended for orchids. Some of the preferred substrates are fir bark, coconut coir and sphagnum moss. In a separate, clean container, add boiling water to the potting mix for the new pot and allow to sit for a while until the water comes to room temperature. Gardenista recommends adding about twice as much water as potting mix and draining off the excess. Orchids are very susceptible to disease and fungus. Before beginning this project, thoroughly clean and sterilize any tools you will be using such as scissors or a garden trowel. One of the easiest and quickest ways to disinfect tools is to wipe them down with a solution of 70 percent isopropyl alcohol and allow to air dry. 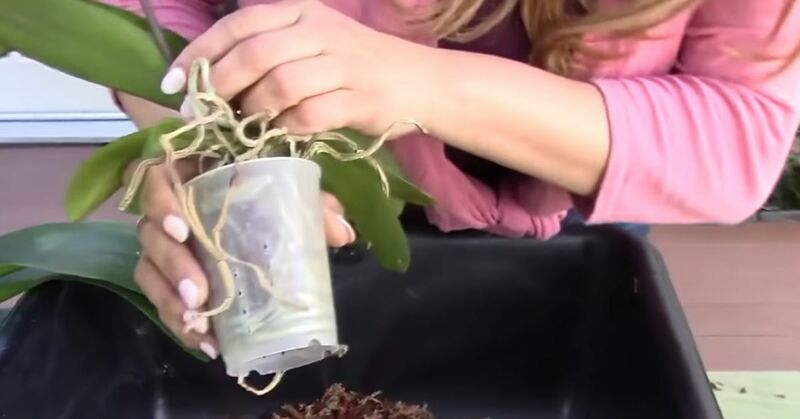 Gently extricate the orchid and potting mix from the old container, being careful to not damage the plant's roots using too much force. Using your hands, remove as much of the growing media from the roots as possible. Carefully untangle the roots from one another as well. Remove any dead or diseased roots, as close to the plant as possible using sterilized clippers or scissors. This will allocate plant resources to healthy tissues instead of the orchid trying to "feed" the problem areas to nurture them back to health. Add a shallow layer of potting media to the bottom of the container. Place the orchid in the pot so the crown is level with the top, and fill in all of the empty space with bark or whatever media you are using. Use your fingers or chopsticks to gently settle it in around the roots. Once the orchid is nestled securely in its larger home, care for it as you did in the past, including staking it to provide support.